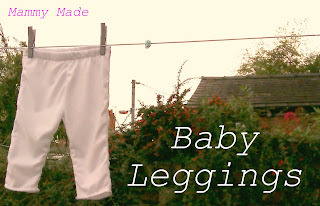 It is so easy to make baby leggings. 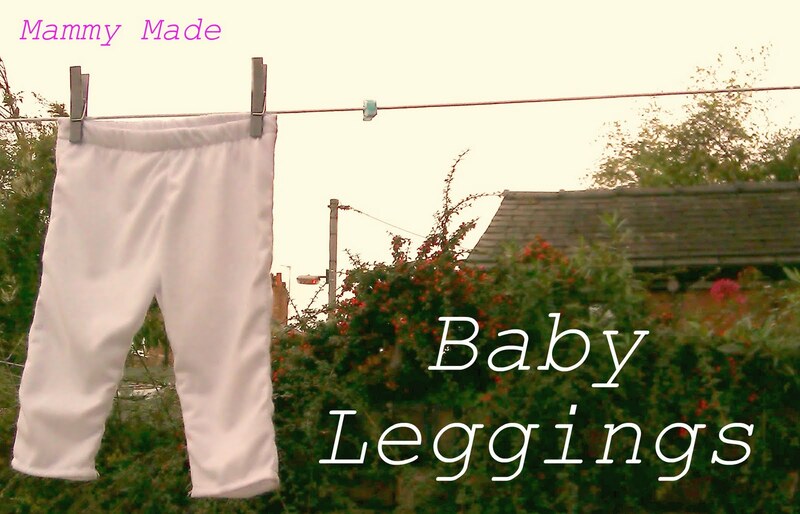 All you need is a pair of baby leggings that fit your baby/toddler. I started off with a pair of 6-9months leggings. To make your pattern, fold the leggings with the front showing, then draw around onto pattern paper. I use baking paper for my patterns since they're mostly baby sized so I can get away with it. 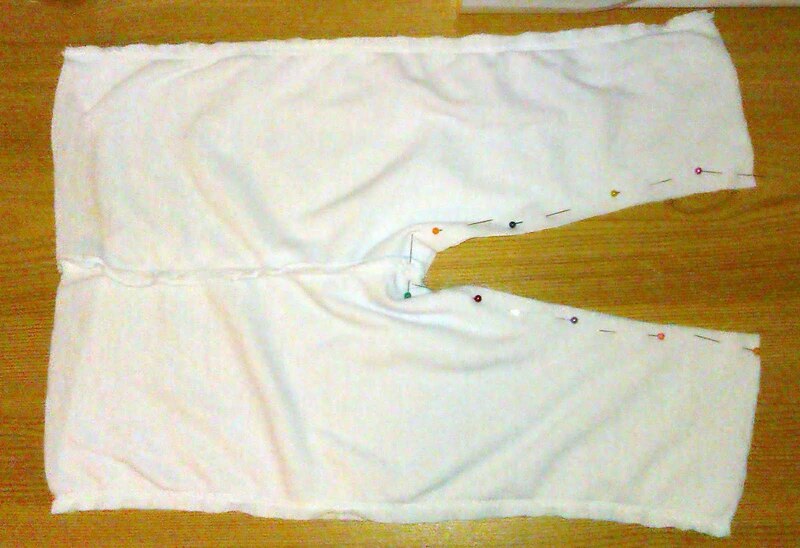 Fold the leggings with the back showing and draw around that side too. 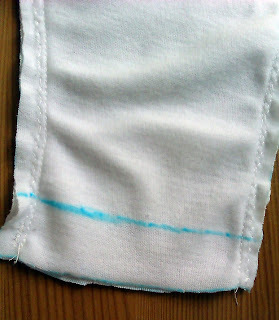 Then you'll want to draw around and add 1/2" seam allowance all around the side edges. 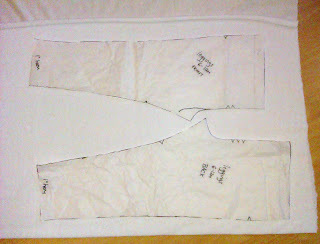 Make the leg hems 1" longer. if you're using 3/4" elastic like I did, you'll want to add an extra 1" on top too. If you use a wider elastic you'll need to add more allowance here. You should notice the two pieces are slightly different, in the rise and sometimes in the crotch. See how the rise is a few inches higher on the back and the back crotch is shaped slightly differently? You can usually get away with using the same shaped crotch on both front and back but it's better to lift the back rise a little bit, especially if you are using cloth nappies. Most leggings you can buy are shaped like this because they fit much better. Lay out your pattern pieces on your folded knit material so you cut two identical pieces out for each side. Make sure the crotch on both pieces is facing in! Oh and make sure the stretch is going across the legs, not up and down or you'll struggle to get them on! Pin together the right leg's front and back along the side seams, with right sides together. Do the same for the left leg. 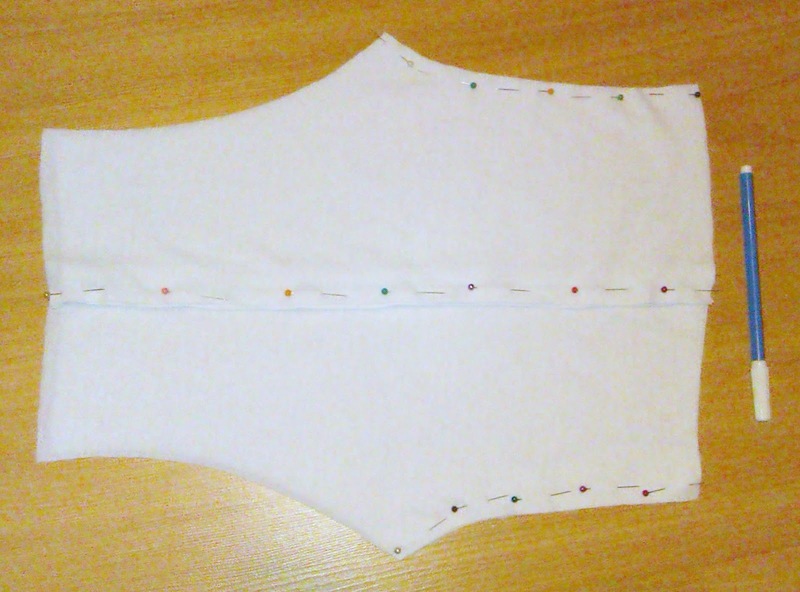 Pin the two fronts together along the crotch-waistband curve. Do the same for the two back curves. Stitch everywhere you've just pinned (I used a straight stitch and then a narrow zigzag right next to it in the seam allowance). 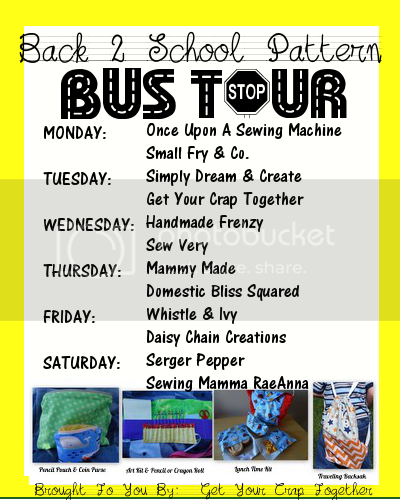 Serge if you have a serger handy. Mine is set up with all black thread and I really didn't feel like rethreading it all so I opted for stitch and zigzag. Pin and stitch the legs, reinforcing a bit at the crotch. Again I did a straight stitch then a narrow zigzag in the SA. Your leggings will be looking a lot like leggings now. Just the elastic and hems to go! 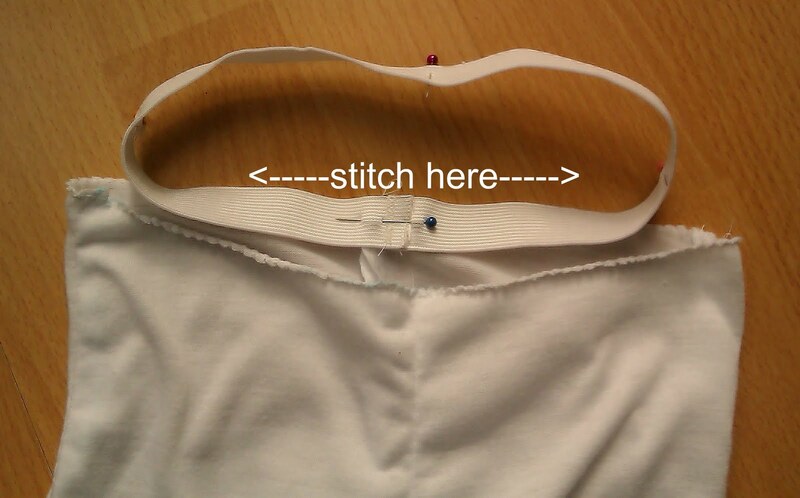 Cut a piece of 3/4" elastic to your baby's waist size. Naomie's was 18" and she has just gone into size 6-9months. When measuring your baby's waist, you want to hold the tape measure so it's a little loose so it's not uncomfortable but not too loose that it falls straight off. Stitch the two ends of the elastic together, to form a loop. Pin the stitched edge at the back seam of your leggings, inside. Mark the other 3 points on the elastic for the front and 2 x side seams. 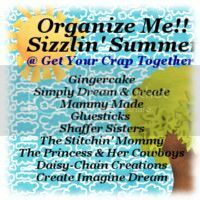 Using a long, wide zigzag or a serger, stitch along the top, right on the edge. Stretch the elastic to reach each seam, try not to pull the knit. 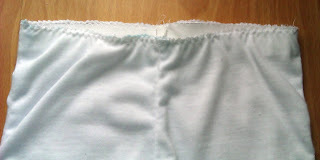 When the elastic is sewn in, fold the top over to the inside, encasing the elastic. Stitch a top seam along the serged/zigzagged edge, stretching as you go. Remember only to stretch the elastic, not the knit. Now to hem the legs. I sometimes really struggle with hems because I like them to be as exact as possible and if theyre not as perfect as I can get them, I freak out! What I do now is draw a line double the length of hem I want. For these leggings I wanted a 1/2" hem so I drew a line right across with washable pen, 1" up from the bottom. To do my hem I just lift the bottom up to meet the line all around and I know it's about as perfect as I'm going to get it. Stitch using a narrow zigzag to allow for some stretch. LOVE this!!!! With cold weather on the horizon, I will be making several of these. Thanks so much for posting this tutorial! Very cute and great tutorial. 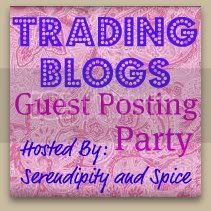 Thanks for posting at the Rhinestone Beagle! Those are too cute! I love leggings on babies! Thanks for the tutorial!